Last week I talked about how sparkling wine does not get its due respect here. The same can be said for dessert wines here on my blog. It’s not that I don’t like them, I just don’t seem to drink them. Unless there is some kinds of desert involved. The very first time I visited Waters Crest Winery in Cutchogue, I walked away with a bottle of Jim Waters late harvest Desert wine. When I recently attended a wine dinner at The Melting Pot and Jim’s wines were paired perfectly with 4 courses, the only thing missing was his Late Harvest. However, Jim knew better and brought some for all to taste. Year in and year out, this is one of our favorite dessert wines. 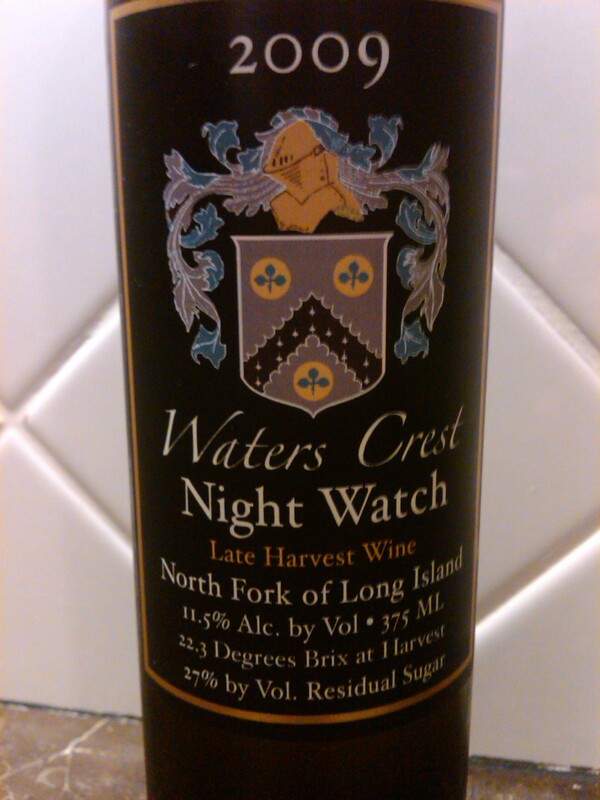 Here’s why Waters Crest Winery 2009 Late Harvest Night Watch ($45) is one to seek out and why it was a finalist on the NY Cork Report’s Wine of the Year for Long Island Desert Wines. On the nose this golden-colored wine was bursting with apple, apricot, melon, peach and clover honey. Notes of baking spice, candied ginger, orange blossom and orange peel rounded out the nose. As the wine warmed the notes of fresh peeled oranges dominated. On the palate, this viscous, honey like wine brought notes of dried apricot and peach with hints of spice, clove, almonds and more clover honey. The wine showed great balance between the acidity and sugar. There is a lot of sugar here and the key is to bring enough acidity to make it balance, this wine delivers. The finish is delicious with notes of honey, apricot and baking spice. Make sure you stop in and have a taste, you won’t be sorry and you will probably walk out with a bottle. There is not much left, this was a very limited production wine, so don’t miss out. This entry was posted in 2009, Desert Wine, Long Island, Waters Crest Winery. Bookmark the permalink. Been thinking about these wine’s. we should try more!